It’s apple cider season! Not the apple cider that’s been stored somewhere for who knows how long before put out on the store shelf. It’s the season of picking, crushing and pressing fruits to make cider. We offer a variety of fruit presses! Let’s start with the Apple & Fruit Crusher for hard fruits. Before you press your apples or pears you should break them up. If you have just a few you’ll be fine cutting them into quarters or halves depending on size, before you put them into the press. More than that and you’ll spend a long time cutting. The Crusher mounts easily on a table top. I’ve seen it mounted between two saw horses. Whatever works for you is great. It’s that simple. 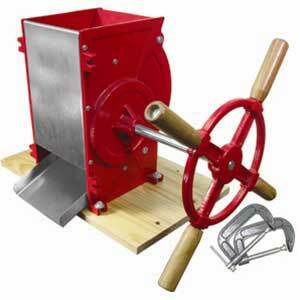 I love the old-timey look of the Crusher with its bright red color and old fashioned handle. 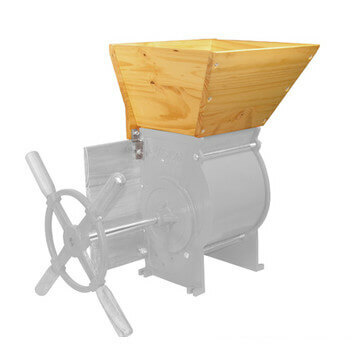 The Apple & Fruit Crusher is easier to load when you add the wooden Hopper. It’s sturdy, easy to put together, and holds a peck of apples at a time. Pouring the apples into the Hopper will save you time and a lot of bending to pick up fallen fruit. We offer Fruit & Wine Presses from a reputable company called TSM. They’ve combined the old time feel of hand cranking and beautiful presses with modern technology. The baskets are made of oak grown in the USA! Each press comes with a filter bag except for the Deluxe Stainless Steel Press which doesn’t need one. The Harvest Deluxe Fruit & Wine Press is my favorite. It holds 4.7 gallons of fruits. It’s sturdy, mounts to a wooden base for added stability, and has padded hand grips. You’ll be able to press your hard fruits as well as grapes and other soft fruits. The juice drains from its spout into your container. 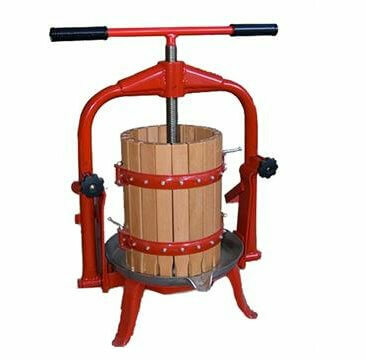 We also have the Harvest Apple Fruit & Wine Press that holds 4.7 gallons of fruit, and its larger model that holds 8 gallons of fruit. If you prefer a ratchet model you’ll find it here. You can drink your juice fresh or turn some of it into cider. We love to cook with cider. One of our dishes is pulled pork that has been slow cooked in apple cider. Add everything together in the slow cooker, set it on low, and let it cook for at least eight hours. It will pull apart with a fork as you take it out of the slow cooker. This entry was posted in Canning, Homesteading, Recipes and tagged Fruit presses, recipe on September 16, 2014 by Homesteader's Supply.